Millennial entrepreneurs in the Middle East also seem to work the hardest. Their average workday is 12.5 hours, more than 2.5 hours above the global average for millennials. They’re the Middle East’s greatest asset and their entrepreneurial spirit seems to be shaping the future of the region. According to Sobhi Tabbara, HSBC’s Global Market Head of Private Banking in the Middle East: “Middle Eastern entrepreneurs are incredibly driven in meeting their goals, with a hungry young generation working significantly longer hours, compared to the rest of the world, to achieve this”. According to Cisco, 69% of consumer internet traffic in 2017 in the region will be to video. In fact, the world’s most avid YouTube viewers are in Saudi Arabia. The rise of video consumption and content creation via YouTube, has made online video the marketing weapon for targeting millennials in the region. YouTube has more than a billion users, almost a third of all people who use the internet. Every day those people watch hundreds of millions of hours of videos on YouTube, which in turn generates billions of views. According to a Google report, watch time on YouTube is growing by 60% year-on-year in the MENA region, which ranks second after the US and ahead of Brazil in terms of watch time. Young creatives also emerge as part of a media revolution that has changed the way millennials seek entertainment. In particular, more women are using YouTube to express their views and creative talent. For example, Hatoon Kadi, has become the face of female comedy in the Kingdom of Saudi Arabia, with a loyal follower base on YouTube. She recently spoke to CNN about creating engaging online content: "I just seized the opportunity because female perspective is lacking." Across the Middle East and North Africa, content relevant to women has seen a 50% year-on-year growth, challenging negative perceptions of the region. Saudi Arabia leads the region with the most female-led channels, ahead of Morocco, the United Arab Emirates, and Iraq. Millennials in other parts of the world are promiscuous in their brand loyalty, which is a growing concern for marketers. 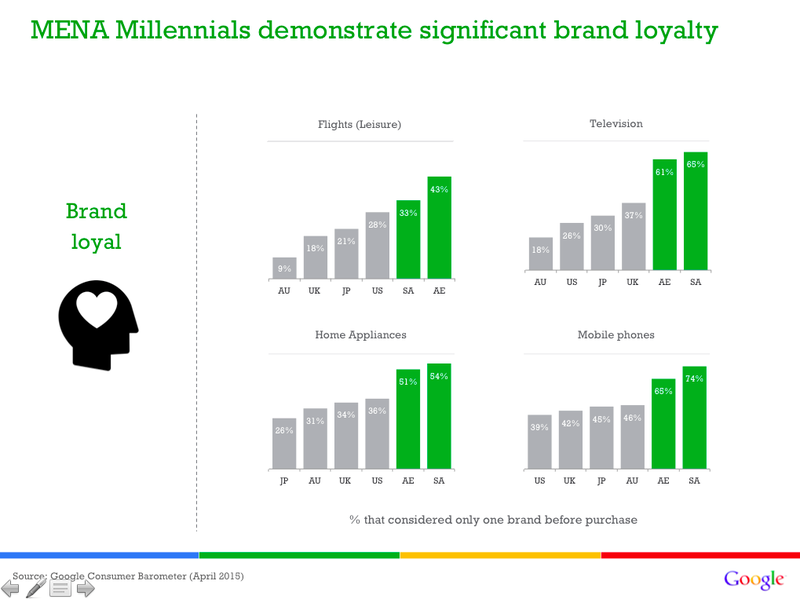 However, according to the Google Consumer Barometer, millennials in the Middle East demonstrate more brand loyalty than their peers in the US, the UK, Japan or Australia. Saudi Arabia and the UAE show a significantly higher percentage of millennials who consider just one brand when they buy. Forty-two percent said the private sector has the strongest influence, while 27% chose the government. Individuals alone were seen as having less ability to influence society. When it comes to influencing an organization, however, only a quarter of millennials in the Middle East chose it as a goal, in comparison to nearly half in Europe and North America. According to the 2016 ASDA'A Burson-Marsteller Arab Youth Survey, 53% of millennials in the region believe it’s more important to have stability than democracy and 67% think that Arab leaders must work harder to improve citizens’ human and privacy rights in Arab countries, as well as women’s rights. There is almost no difference in the percentage of men and the percentage of women who support more women's rights. You've heard of Boomers, Gen X and Millennials - but how about the Xennials?